Learn how to mentor without harm. 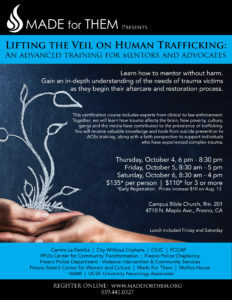 Gain an in-depth understanding of the needs of trauma victims as they begin their aftercare and restoration process. This certification course includes experts from clinical to law enforcement. 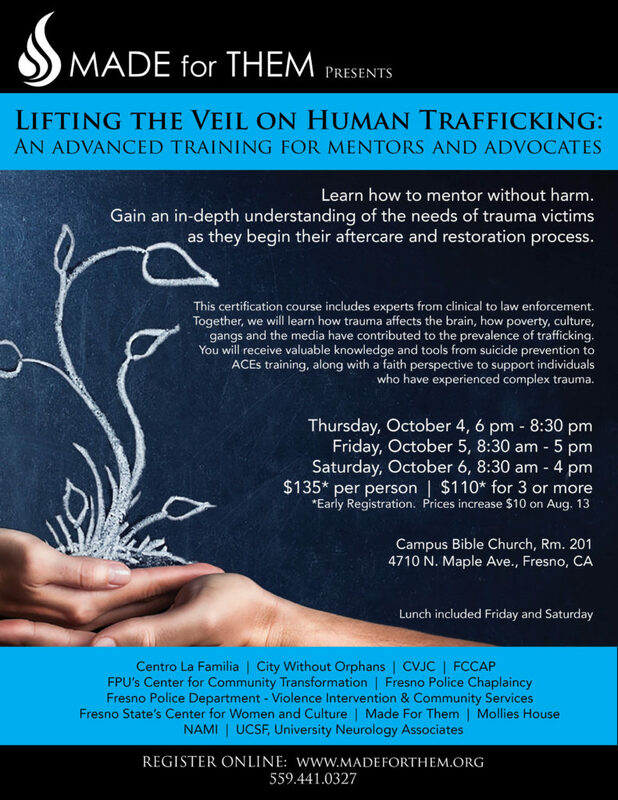 Together, we will learn how trauma affects the brain, how poverty, culture, gangs and the media have contributed to the prevalence of trafficking. You will receive valuable knowledge and tools from suicide prevention to ACEs training, along with a faith perspective to support individuals who have experienced complex trauma. Dr. Randy White and his family moved from Clovis in 1993 to Fresno’s highest crime, highest poverty community to seek its peace, and have served in some of Fresno’s most vulnerable neighborhoods. He founded the Pink House Center for Urban Ministry Training and The Wise Old Owl Tutoring Program in the Lowell Neighborhood. He then worked internationally as head of the Bakke Graduate University global doctoral degree programs, training leaders from 39 countries for urban transformation on five continents. He is the author of many articles, and his books include The Work of Our Hands (Condeo Press, 2012), Encounter God in the City (IVP, 2006), and Out of Nazareth: Christ Centered Civic Transformation in Unlikely Places (Urban Loft, 2017). 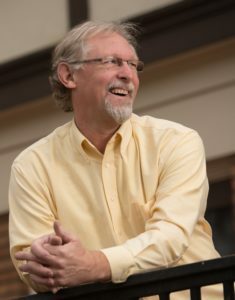 White is the Director of the Fresno Pacific University Center for Community Transformation and associate professor of community transformation at FPU Biblical Seminary. White’s doctorate is in global urban leadership. He holds two masters degrees, one in Christian Studies and the other in Urban Sociology and Community Development. He has been married to Tina for 37 years, has two married sons and six grandchildren. For fun he enjoys creating art glass mosaics, and is currently writing a novel. Miss Navarro has been Community Coordinator of the Violence Intervention & Community Services, formerly known as Mayor’s Gang Prevention Initiative, since November 2006 under the umbrella of the Fresno Police Department. She has worked in the Fresno County area for the past 21 years with the gang population in and out of the criminal justice system. Miss Navarro’s experience working with grassroots organizations such as Fresno Barrios Unidos, Colegio Popular and Proteus Inc. have given her the grounding and direction on developing a community based and driven Gang Prevention and intervention Initiative. She is the middle child of five children and raised by two migrant parents married over 50 years. 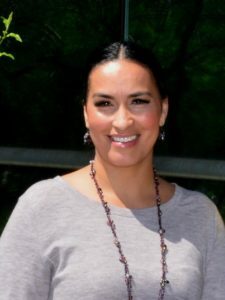 She currently holds a dual Bachelor of Arts Degree in Sociology & Chicano Latin Studies. Her mission in life has revolved around the youth and adults in her community caught in the chaos of gang culture and violence. 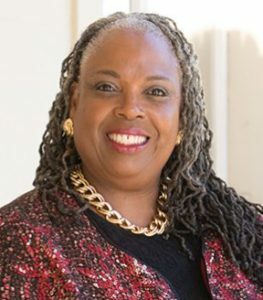 Francine Oputa is the director of Fresno State’s Center for Women and Culture which houses the Central Valley Cultural Heritage Institute and the Women’s Resource Center. She also serves as the director of the campus’ National Coalition Building Institute Team. Prior to this appointment she was the coordinator of the Women’s Resource Center for over 15 years. She also teaches periodically in Africana Studies and Women Studies. Her areas of interest include diversity issues, cultural competency, and intersections of ethnicity, socioeconomic status, faith, and gender identities. Desiree was a full time missionary in Bucharest, Romania for 6 years. She has worked with abandoned babies, street children and women at risk. She is a co-founder of a women’s home in Bucharest that still exists and provides a life changing opportunity to heal, transform and flourish for marginalized women. She is passionate about serving women and children locally and internationally. Michael and Tiffany Jost have been married for almost 15 years and parent 3 children, one of whom was adopted internationally. They are Empowered to Connect Parent Trainers and teach families about TBRI© Trust Based Relational Intervention. They are passionate about helping children that have experienced developmental and relational trauma. 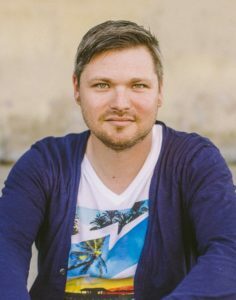 Born to missionary parents, Ryan Townsend grew up overseas, often witnessing extreme poverty up close in cities and villages around the world. He returned to the Fresno area and graduated from Clovis West High School, later earning a B.A. in Communications from Cal State Fullerton. In his early 20s, Ryan gradually became aware that injustice was routinely met with indifference and often buried under ignorance. This realization fueled a lifelong mission of fighting for the poor and led to volunteer advocacy work with World Vision, The ONE Campaign, CASA, Freedom From Hunger, and No More Slumlords. 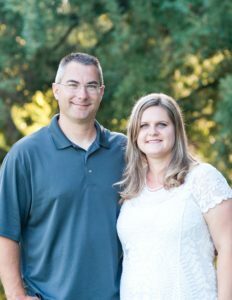 For 10 years Ryan served in various pastoral ministry roles, including the last eight at Northpark Community Church where he has been an ardent supporter of CVJC. Ryan’s wife, Bekah Townsend, is worship pastor at Northpark and they have three young children: Amelia, Micah and Kathryn. An avid music fan and musician, Ryan grew up playing in bands and occasionally can still be found playing around town. His other interests include independent cinema, graphic design, fixed-gear bikes, and various other hipster pursuits.